The year is 336 BC, the Persian Empire is in decline, Greece is rising in importance and power thanks to the unity and stability brought on by Phillip II of Macedon and Alexander III comes to power. Alexander’s father, Phillip, provided for Alexander in every way. His tutor was Aristotle, at a young age he was given responsibility in military command and, on Phillip’s death, he was left with “the most perfectly organised, trained, and equipped army of classical times”. They say that, by age 33, he had conquered most of the known world, a deed which has earned him the appellation of “great”, but would anyone else, given the same preparation, training and opportunity, have done the same? Alexander was a product of his time. Like Cyrus, who was likewise called “the Great”, who had the good fortune of being the one to fill the power vacuum left behind by the sudden fall of the Assyrian empire, Alexander too took advantage of a fortuitous situation and stood on the shoulders of giants to make a name for himself. Or did he? Perhaps another person, given the same circumstances would have achieved much but possibly not as much. Alexander’s mark on the ancient world seems omnipresent, moreso than the marks of previous Greek achievement which, curiously only appear important in the record of the Greeks. How does one define what greatness is? It is such a subjective thing, to append the appellation “the great” to a person’s name. What, to some, may be deemed great might, to others, be quite the opposite. The various historians are fairly well-agreed that Alexander did a great many things although their interpretation of the significance of these things do sometimes differ. What can be agreed on, however, are general facts, things such as the battle of Gaugamela occurring on October 1st 331, eleven days after a lunar eclipse. It is on the facts themselves which we will attempt to determine our own interpretation of whether or not Alexander is really deserving of being called “great”, or whether he was a simply riding the wave of momentum which was well-and-truly already in motion. The Greeks speak of him as the warrior king par excellence, but this is to be expected from a people whose propaganda machine was well-known in the ancient world. Even from very early on, when Greek colonies were expanding into the Mediterranean, their rivalry with the Phoenicians brought on much slanderous propaganda with the Greeks accusing the Phoenicians of everything from being uncivilised to being baby-killers. Already incidents like the battle of Marathon had been inflated in importance in the western canon. For the Persians, this battle would have been little more than a border skirmish but for the Greeks it was one of the most significant battles in their history. Phillip, his father, had been preparing for an invasion of the Persian Empire. It was his shrewdness and organisational prowess which had turned the Macedonian armed forces into the force that it was. He revolutionised the way that pitched battle was fought then went on to unite the Greek city-states, laying the foundations for a stable base of operations from which to launch his invasion. Phillip set the stage for the conquest and his ambitions were cut short only by his own assassination. From the momentum that Phillip must have created in his administration, sometimes one can’t help but think that Alexander couldn’t have helped but do the deeds that he did. Phillip’s influence on the ancient world is so significant that it is said by some that “the greatest personality in the ancient world, during the quarter-century between 360 and 336, was the Macedonian King Phillip II, son of Amyntas”. At his assassination at the age of 46, he had built up Macedonia into the leading nation of the ancient world and left in Alexander’s hands what was arguably the most well-trained and disciplined fighting force that had ever been. Without this vital ground work, Alexander’s accomplishments would have been quite impossible. When Phillip was assassinated Alexander was barely twenty years of age and as yet so inexperienced and untrained that it seemed to all Greece that the Macedonian empire was about to dissolve. The events which followed are our first evidence that Alexander was more than a mere beneficiary of the great momentum of Macedonia, set in motion by Phillip and relayed to Alexander. Indeed, we learn that not long before his untimely demise, Phillip’s marriage to Cleopatra caused a rift between himself and Alexander’s mother, Olympias. When the important Macedonian general Attalus implied, with a drunken comment, that Alexander was not a legitimate heir Alexander threw his cup at him and was banished along with his mother. Here we see that the power of Macedonia, which Phillip had, by his deeds, built up over the years of his rule, was not handed to Alexander on a silver platter. We know that Phillip and Alexander reconciled before Phillip’s death, but surely this friction between them cast a shadow of doubt over the certainty of the succession of power to the Macedonian throne. This doubt permeated throughout the ancient world and not just in Macedonia. The Athenians were even said to have sent a thank you note to Phillip’s assassin. Alexander had to act quickly to secure not only his own position, but to preserve the momentum and the nation that Phillip had created. This he did, with his characteristic swiftness and before any of his enemies had time to organise against him, they had been either marginalised or killed. A distinguishing quality with which Alexander was particularly well-endowed was the ability to choose the precise moment at which his acts would have the greatest effect and to execute his actions with great speed. This ability, so unfathomable, so immeasurable, can be truly attributed to Alexander himself. No matter what his education and no matter what his parenting, this quality is one which cannot be borne out of the fortuitous circumstances in which he was raised but were an integral part of his very being. This is the first thing which may distinguish Alexander from the average person and raise him somewhat towards the lofty heights of being called “great”. His quick thinking and speed at which he carried out his plans may have brought him distinction in matters in which timing is all-important, such as in battles and securing power in the diplomatic arena, but did he act with distinction in matters in which timing was not paramount? Also, we cannot neglect the fact that luck probably had a bigger role to play than the various histories probably suggest. While it is said that, in the case of preparing for the battle which would eventually become known as Gaugamela “It was a hopeless task to improvise in a year and a half a force fit to meet a professional army commanded by a genius”. However, the Cambridge history goes on to say “…but they made a credible attempt, thought they could not take the most necessary step of all, the removal of Darius from command in the field”. Alexander may have had victory over a numerically superior foe, but this numerically superior foe was at the command of an acumen-inferior commander. The Persian Empire, as was mentioned above, was already in decline. After the death of Xerxes, the empire was left with a power vacuum and the years that followed were marked by a quick succession of rulers who squabbled with (and occasionally killed) each other for power and, when there, neither consolidated nor achieved anything of note. In fact the years between 424 and 331 saw 8 different Kings rule Persia. Darius III, despite some pro-Alexander sources, was not Alexander’s equal in battle nor was his Persian infantry. The Greek mercenaries who fought on the side of the Persians were the only equals on the battlefield to the Macedonian Phalanx, at least in the earlier battles of Granicus and Issus. The Persian generals, however, could hold their own. So valiant was Mazeus in commanding the right flank of the Persian line at Gaugamela that Alexander himself appointed him as Satrap of Babylon. The state that Persia had been left in was also quite fortuitous for Alexander and his bold plans. The organisational structure of Persia was such that the empire was divided into regional “Satrapies” which were governed by a “Satrap” (funnily enough). The Satrap paid tribute to the King in the form of Gold and Soldiers, in exchange for military protection. The Satraps generally retained a great deal of autonomy. As Alexander moved through the Empire he didn’t so much “liberate” the people, as the Greek propaganda would have us believe. He merely exchanged one king for another, although, as a rule, he would leave military governorship to a Macedonian. As far as the people of the vast Persian empire were concerned, they would have barely noticed a change. Alexander could offer the same, if not better, military protection to the satrapies as Darius could and he was happy to leave things as they were, which was probably a great relief to the Satrapies and the people who populated them. What facts now remain which might crown Alexander as “Great”? The evidence points to a land which was ripe for conquering. It also tells us that Phillip, Alexander’s father, had done all the necessary preparation, including building the greatest army of the world at the time, for an assault on the Persian empire. We do now know that Alexander’s succession was, by no means guaranteed, and Alexander had to act skilfully and swiftly to seize power, this we can credit to him. The leaders of the Persian empire were certainly below par, one can only imagine how different history may have been if Alexander had to face Xerxes at the height of his powers. Of course, what are left are the battles themselves. Hannibal was, by far, the greatest general of his time, but he failed to conquer Rome. Why? Well, the Roman empire wasn’t in a state which was as conducive to being conquered as the Persians were, but we may still call Hannibal a “great” general. One need only analyse the stratagem and immediate outcome of the battle of Cannae to appreciate that. Did Alexander measure up? According to Hannibal himself (according to Livy) he did, and Hannibal famously listed Alexander atop Pyrrus and Himself as the greatest generals ever to have lived. Whether or not this conversation took place is questionable as it could have been pro-Roman propaganda, although it is interesting to note that Scipio didn’t rate a mention on the list which lends it some degree of credibility. Did Alexander simply do what his father did, or did he himself exhibit an ingenious creativity of his own? Brilliant men rarely produce brilliant sons, and Alexander was fearful at an early age that the shadow cast by his father would eclipse his own ambitions. In 338, Alexander was given command of the companion cavalry in a battle fought under his father at Chaeronea. Here the Macedonians fought the Athenians and Thebians whose forces included the “Sacred Band” a unit of about 300 infantry men who were said to be invincible in battle. Alexander seized his moment and charged the infantry line when a gap opened due to a feigned retreat from Phillip. The battle was quickly decided and an 18year-old Alexander became a hero. Alexander also fared rather well on his own. The famous battles of Granicus, Issus and Gaugamela are testament to this. Although at Granicus, it is likely that the Persian and Greek forces were roughly numerically matched (the Greeks may have even outnumbered the Persians in this instance), in both Issus and Gaugamela, the Greeks were almost certainly outnumbered, comprehensively so in the latter. It is easy to see how a well-trained force such as the Macedonian phalanx could overcome an enemy in instances where they are roughly numerically evenly matched, but when one is quite outnumbered, good leadership is required. If in no other aspects it is clear, then it is certainly clear in this one that Alexander possessed a greatness in the highest order. His audacity certainly surpassed Phillip and the method by which he advanced his line in a diagonal at Gaugamela he also learned from his father, but his ability to do exactly the right thing at the right time, to structure his battles in such as way as to be able to personally make a decisive charge at precisely the correct moment and thus turn the battle in his favour surpass any of the leaders of the time, perhaps even ever. There are so many aspects of Alexander’s life that it is difficult to cover them all in such a short essay. Even so, as the events occurred more than 2000 years ago, it is also difficult to discern just what is fact and what is fiction from the limited, and admittedly one-sided accounts which survive to this day. The above analyses serve not as an in-depth analysis of various aspects of Alexander’s life, but as a concatenation of those various aspects with the aim of illustrating the “facts” in light of the question of Alexander’s greatness. As such, in most areas, it is largely inconclusive as to whether his success in those areas was truly due to his greatness or were simply the product of fortuitous circumstances. His ability to seize the moment and to act swiftly and decisively in all matters, from diplomacy to the battlefield, is one aspect which we cannot ascribe to luck and thus must add to the picture of Alexander’s greatness. His ability, in battle, to face a numerically superior opponent and completely obliterate his army time and time again, and under many different circumstances (most of which weren’t discussed) is also something which we may not be able to attribute to luck, especially given such a plethora of examples and NO counterexamples. Very little is known for sure about Alexander – the person, and as such this aspect was not explored. Even if more was known, it is entirely too subjective to ascribe a scale of greatness based on personality. 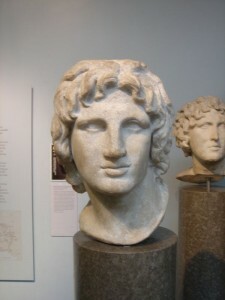 Alexander is known to us primarily as a General and as a King. In a militaristic society, as existed in his day, his greatness as a king was intrinsically tied to his success as a general. His success as a general is beyond question. Another person may have been moderately successful under the same circumstances, but it is now reasonable to conclude that only Alexander would have been that successful. The degree to which Alexander was “Great” is certainly arguable, but the question as to whether or not he was or wasn’t great, is not. Alexander was great. Despite the morality of using violence to achieve personal or political aims, the fact remains that Countries exist because of wars fought against their neighbours or rivals. Independence is largely secured through the employment of armed forces and the willingness to fight if threatened, this alone prepares us all for such an eventuality. I commend you on your site it contains a lot of quality information and is well done.